Robert Harris was born in Nottingham in 1957, later studying English at Cambridge University. He was a TV correspondent for the BBC and has also worked as a columnist for the London Sunday Times and the Daily Telegraph, and as Political Editor for The Observer. He was named 'Columnist of the Year' in the 2003 British Press Awards. As well as several non-fiction books, including Selling Hitler: The Story of the Hitler Diaries (1986), he is the author of six novels: Fatherland (1992), set in 1964 in Berlin; Enigma (1995), set in World War II; Archangel (1998), set in present day Russia; Pompeii (2003), a dramatisation of the eruption of Mount Vesuvius in AD79; Imperium (2006), the first of a trilogy of novels about Cicero; The Ghost (2007), narrated by a professional ghost writer; Lustrum (2009), the second in the Cicero trilogy, shortlisted for the 2010 Walter Scott Prize; The Fear Index (2011); An Officer and a Spy (2013); and Dictator (2015), the last in the Cicero trilogy. His novel Enigma, about the codebreakers of Bletchley Park, was made into a feature film directed by Michael Apted, from a script by Tom Stoppard. Archangel, the story of a historian on the trail of Stalin's secret diaries, was adapted for BBC Television in 2005, starring Daniel Craig. Pompeii has recently been adapted for film by the author, and will be directed by Roman Polanski. Robert Harris lives in Berkshire and is a Fellow of the Royal Society of Literature. 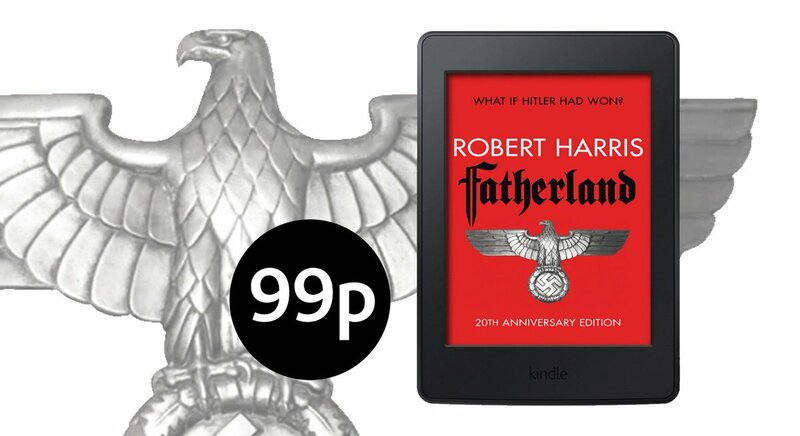 Since the publication of his debut, Fatherland, in 1992, Robert Harris has been using fiction to write the history of the present. He gives narrative form to his preoccupations, and, while providing well-crafted entertainment, invites serious reflection on contemporary matters of significance: the dominance of Europe by a centralised bureaucracy; the way a sudden explosion can decentre a proud and dominant civilization; the escape from justice by a former Prime Minister accused of war crimes; the covering up of the truth by an intelligence community that wishes to pursue its own course independently of the veracity of its claims or the legality of its methods; and the persecution of a whistleblower intent on alerting the public to hidden realities. Harris’s books are rare in that they are so overtly political. This isn’t drawing-room fiction about emotional breakdown or the terrible loneliness of a wet Wednesday afternoon in January. Harris’s fiction is engaged. The chill of Fatherland, the brilliant exercise in alternative history which both made the author’s reputation and allowed him to make the transition from political journalist to novelist, comes from its entirely plausible recreation of a world in which Hitler is triumphant. It is 1964, and post-war Europe is dominated by the victorious Nazi party. Germany presides over a twelve-nation union, while many countries in the East have been subsumed within the Greater German Reich. Britain has sued for peace, and Russia, as far as east as Moscow, has been defeated. It is the year of Hitler’s seventy-fifth birthday and nothing must be allowed to come in the way of the celebrations. While investigating a drowning, Xavier March, a disillusioned SS officer, uncovers a trail which will ultimately lead directly to the secret extermination of European Jewry. Harris stayed with the Second World War for Enigma (1995), a novel inspired by the cracking of the German U-Boat code at Bletchley Park. It deals with a group of brilliant individuals - full of the customary quirks and eccentricities that we mortals like our philosopher-gods to possess - who work together in an environment dominated by intellectual stimulus, official secrecy, and the inescapable cold of a British winter in war time. Harris has described the achievements of what was known as Station X as ‘the most successful sustained intelligence effort in the history of warfare,’ and, in light of this remark, his novel might be read as a paean to the codebreakers’ achievements. Archangel (1998), the author’s third novel, set largely in contemporary Moscow, deals with the ghosts of Russia’s totalitarian past and the fragility of its democratic present. The investigations of Fluke Kelso, a dissolute and irreverent historian, who is on a quest for Joseph Stalin’s secret papers, the discovery of which Kelso hopes will make his academic reputation, take the young scholar to the remote White Sea Port of Archangel, and the discovery of the Soviet dictator’s final secret. With Pompeii (2003) Harris moved away from the Second World War and on to the ancient world. The novel is reminiscent of Enigma in that it imaginatively recreates a specific place and event. And yet Pompeii is more ambitious in that it reconstructs an entire world in all its luxuriousness and power, a world remote to us in time, but one which evokes inevitable comparisons with the Rome of the own day: the United States. Although the complete destruction in AD 79 of the towns of Pompeii and Herculaneum is familiar to us from the tales of our schooldays, no British writer has tackled the subject since Bulwer-Lytton’s The Last Days of Pompeii in the mid-nineteenth century. Harris’s portrait of local corruption and the extraordinary feats of Roman engineering is both compelling and impressive. The reader might be aware of how the book will end, but such is the author’s way with the accumulated anxieties of suspense that the finale comes almost as a surprise. In 2006 Harris published Imperium, the first part of what is to be a trilogy of books about Cicero, the great Roman statesman and orator. It was followed by Lustrum in 2009. These novels take the form of biographies, written by Tiro, Cicero’s amanuensis, secretary, assistant and confidante, who tells of his master’s attempt to win control of Ancient Rome. ‘It is of power and the man that I shall sing,’ writes Tiro at the beginning of the story. ‘By power, I mean official, political power – what we know in Latin as imperium – the power of life and death, as vested in an individual.’ Imperium and Lustrum are recognisably Robert Harris novels: there is the careful plotting; the natural ease with historical setting; the great breadth of reference. But there are moments when the language jars. At one point in Imperium Tiro describes Cicero as having to ‘put up with the taunt that he was a draft dodger.’ This phrase, evocative of Vietnam, breaks the illusion of time and place, as the mirror that is being held up to the contemporary world is thrust far too close to the reader’s face. Tiro doesn’t really convince as a narrator, and the flat, matter-of-fact tone chosen by Harris, becomes tiresome. Nevertheless, these novels are illuminating analyses of political psychology, which will be of interest to anyone wishing to understand the mentality of those who seek power. If it is tempting to read Imperium and Lustrum as ironic commentary on modern America, then it is impossible not to view The Ghost (2007) as being a thinly disguised attack on Tony Blair. When a cynical ghostwriter is hired to write the memoirs of ex-Prime Minister Adam Lang – who has ‘elevate(d) the clichés of politics by the sheer force of his performance’ – he soon finds himself involved in a Machiavellian mess. Lang, ensconced on Martha’s Vineyard and feeling the loss of power, has been accused of having allowed for the transfer of British citizens to Guantanamo Bay. Cue a sustained (fictionalised) indictment of the people involved in running the world into ever-darker areas this last decade or more. That Harris feels cheated by Blair, a man to whom he once gave his support, is clear. But The Ghost reads like the work of an insulted intelligence looking for a form to wrap its rage inside. Harris followed The Ghost with The Fear Index (2011). A response to the rapid movement of modern money around the globe and protection of the hedge-fund class by elite politicos hoping for benefit in kind, is brisk and enjoyable, but the character of Alex Hoffman, whose algorithms, which predict how the stockmarket will react to events and which have made him and his associates billions, is cartoonish. The Fear Index is a Bond film in the form of a novel, and while there is nothing wrong with that, what is missing from it - depth, purpose, real punch - is what the author delivers with his most recent novel, An Officer and a Spy (2013). This tells the story of the infamous Dreyfus Affair, which scandalized fin-de-siècle France. When Captain Alfred Dreyfus, a Jew, is convicted of selling military secrets to Germany, he is sent to Devil’s Island, off the coast of French Guiana, where he is shackled to his bed and watched night and day by guards who won’t speak to him. In Paris, Georges Picquart, an army officer, becomes head of the Statistical Section, a promotion to one of the highest-ranking intelligent posts that has only come about due to the officer’s involvement in securing Dreyfus’s conviction for spying. Gradually, Picquart discovers that all is not as it appears to be, that anti-Semitism may be the guiding force behind the treatment of Dreyfus, and that those responsible will do anything to ensure that what they have done remains hidden. As with Pompeii, the end of the story is known, but Harris recreates the past in such convincing detail, and controls the release of information with the sure touch of a master, that the novel, part spy thriller, part court-room drama, is as stimulating and politically-charged as The Fear Index is slight and a bit ridiculous. The plot of An Officer and a Spy, which is one of Harris’s most impressively realised novels, concerns a discredited intelligence dossier and the dreadful solitary confinement of a wronged man. It will resonant with readers who are in any way troubled by recent geo-political events in the post-911 world. Robert Harris tends to be overlooked by the more literary reaches of the British book world, but what does that matter? His achievement is a singular one. One of the finest novelists of his day, and without question the pre-eminent writer of political thrillers, he manages, at his best, to turn the considerable research he does into fiction by means of an enviable narrative gift. Eschewing fashionable metafiction and extravagant language in favour of a clear and direct style, Harris, by tilting the historical glass with such deftness, helps us see how the light shines on our own day. In so doing, he achieves what most political columnists and tenured historians could only dream of.